One of the most impressive smartphones of Nubia was the Z9, which was launched back in 2015. In some sense, it’s one of the pioneers of current full-screen smartphones. Due to its borderless design, this handset could grab thousands of users’ attention. Moreover, the Nubia Z Premium Edition also brought the first fingerprint recognition technology to China. So there is every reason to think Nubia is one of those Chinese smartphone brands that always come in with innovations and pays too much attention to research and development. ZTE’s Nubia series is 6 years old. To celebrate this and give tribute to its loyal customers, the company has designed an amazing smartphone, which is going to become one of the best creations in the market. As you guess, we are talking about Nubia X. A few minutes back, it was officially uncovered, showing its ambitions and intentions in the top-end smartphone market. As the spokesperson said, Chinese smartphones are in the top 5 list in the world. As for Nubia, its users are concentrated between the ages of 18 and 25. He also recalled the Nubia’s slogan of ‘be yourself, everyone else is already taken’. But it’s too difficult to invent something new in the market that is already too saturated. In some sense, the Nubia X can be considered as a quite new model. Due to its unique dual-color-screen design, this phone has become the first not only in this aspect but in many other as well. It sports a main screen with a screen ration as high as 93.6%. Moreover, this is the only genuine full-screen smartphone in the market that uses an LCD material. The starting price is 3299 yuan ($473). In addition, the Nubia X is also equipped with a Snapdragon 845 flagship processor, dual-sided fingerprint recognition, ‘space argon’ process for hardware-level blue eye protection, 7-mode 34-frequency global network support, and a series of luxury features. There are too many color options and memory combinations. We are reviewing the deep gray variant with an 8+128GB of memory combination. On the front of the packaged, we can see Nubia’s logo. Interestingly, Nubia made a looming X shape on the front with a surface texture. The first impression of the Nubia X when we open the box is excellent. The 93.6% the screen ratio makes people get a screen instead of a phone. Plus, as we said, it’s an LCD screen, not an OLED screen! The main 6.26-inch screen has a 19:9 aspect ratio without bangs, a resolution of 2280×1080, and a pixel density of up to 403. So, the picture is more refined than the array of OLED screens on the market. This is also the only full-screen smartphone with no bangs that also comes with an LCD material. Moreover, as the screen’s blue light is harmful to the eyes, the company has put a special eye protection mode. It is the world’s first hardware-grade eye protection phone. Its anti-blue light coating is certified by TÜV Rheinland. There are two advantages to using an LCD screen. The RGB arrangement of the LCD is more delicate than most OLED screens. The second is the DC dimming of the LCD, which is more eye-protecting than the PWM dimming mode of the OLED. However, since the LCD screen is a rigid screen and cannot be COF-packaged, most manufacturers have adopted AMOLED flexible screens when designing full-screen models. The front of the Nubia X features a hidden earpiece design. This is the narrowest chin on the LCD screen, and it is much narrower than some OLED screens. The top of the Nubia X’s front panel carries only one light effect sensor. On the bottom, there are the speaker, USB Type-C interface, and the main microphone. On the right side, we can find the fingerprint sensor and the power button. The left side of the Nubian X carries another fingerprint sensor, the volume rocker, and the SIM card slot. Yes, you are not mistaken, Nubian X has a fingerprint sensor on both sides. In other words, Nubia X is the world’s first double-sided fingerprint model! This is also the world’s narrowest double-sided fingerprint recognition phone, supporting 0.1S speed unlocking, a recognition rate of as high as 99.98%, and 360-degree touch. The most obvious benefit brought by the double-sided fingerprint is that fingerprint recognition is more convenient. Whether it is the left hand or the right hand, it is very convenient to use the thumb to unlock the fingerprint. Of course, the functions of the two fingerprint sensors are not only the case. We’ get acquainted with them a bit later. The Nubia X’s comes with a dual Nano-SIM card slot and does not support memory card expansion. Press the power button and the second screen on the back of the Nubia X body to light up the secondary screen. Its size is 5.1 inches, coming with the same 19:9 ratio. At the same time, the resolution reaches 1520×720 pixels, and it uses BOE’s OLED material. The secondary screen supports AOD (Always On Display) off-screen display function. Thus, it can display time and other information under the information screen. It uses a Full Touch technology. So you can play games with up to 6 fingers, as shown in the previous pre-heat videos. It has a 100% NTSC color gamut, and a 100000:1 contrast ratio. The second screen uses TFE flexible bonding technology. The phone is the first in the world to use a COB packaging technology. Due to this technology, it achieves a higher screen ratio on the ultra-narrow bezel, and on the other hand, ensures antenna performance and heat dissipation efficiency. The phone sports a graphene heat dissipation. On the top of this side, we can find the only camera module of this handset. It uses a sensors combination of 16MP+24MP, which in its turn is paired with a dual-flashlight design of a dual-color temperature LED flash and a soft light. On the lower part, we can see Nubia’s logo. More importantly, the Nubian X’s sub-screen achieves an optimal balance of transmittance and reflectivity. The entire process uses 70,000+ experimental diaphragms and a new alkali-resistant IR ink in the spray coating process as well as in the glass process. The material and the bonding process are perfectly unified and balanced. At the same time, the front screen is covered with a 2.5D arc glass, while the rear one carries a 3D glass. Due to them, the phone fits in the palm perfectly. For the middle frame is used an aviation aluminum. The Nubian X is equipped with Corning Gorilla Glass, with a multi-layer polymer film, TFE film package, etc. At the same time, it continues using its much-popular aRC technology that provides ultra-narrow borders. The frame is 1.2mm thick only, while the whole machine has a thickness of 8.4mm. The overall weight of this device is 181 grams. So maybe in comparison to current flagships, it’s a bit bulkier. But when taking into account two screens on both sides, it’s quite acceptable. There are also a few color options to choose from – deep gray, sea blue, black gold, and blue gold. The Nubia X comes standard with a 9V/2A up to 18W fast charging head. The Nubia X is also very durable. There were held 90,000+ drop tests from the 1.2m height. The phone resisted quite well. Nubia’s back screen is not just a small screen, it is also an eye-protection screen. Nubia uses a unique anti-blue glass wafer to form a 5-layer anti-blue film through the ‘space argon’ process, to achieve anti-blue super eye protection. In other words, the secondary screen of the Nubia X is a protective eye screen that can alleviate eye fatigue. What’s more, the Nubia X has passed the certification of the low-blue eye standard of the TUV Rheinland. By combining with the deep technology of Rheinland, the Nubia X can strictly suppress the harmful blue light in the screen. In the phone settings, the Nubia X’s secondary screen has a few eye protection levels – basic, light, and super levels. The basic filters a small amount of blue light, and the screen color display is normal; after adjusting to light eye protection, the blue color of the secondary screen is greatly reduced, and the screen is warmed; after the super eye protection mode is turned on, the entire screen is already similar to the paper. Nubia also brings some very useful features to the secondary screen. One of them is the secondary screen handle. This function can be found in the control center of the bottom bar. After the game is opened, the control center can be called out to open the sub-screen button mapping. The specific operation logic is as shown above. After the secondary screen handle is turned on, the L/R two mapping buttons will be displayed in the game. And the functions of the two button mappings can be triggered by the secondary screen. In addition, the coverage area of the secondary screen handle can be adjusted to accurately suit the player’s operating habits. In the game, you only need to tap the secondary screen to trigger the corresponding button function. The Nubia X’s double-sided fingerprint is not just a simple two fingerprints, it also takes on two functions of dual-screen switching and shortcut operation. If you want to switch to another screen display, you can hold down the two fingerprint readers. The fingerprints on both sides also support the setting of the touch function. Instead of the return key and the home button, the two functions can provide a switching between left and right. Under the hood, the Nubia X is equipped with a Qualcomm Snapdragon 845 processor, which is paired with a 6GB/8GB LPDDR4X two kinds of memory and an USF2.1storage of 64GB/128GB/256GB. The Snapdragon 845 is Qualcomm’s flagship chip in 2018. It is based on the second-generation 10nm process. It uses a Kryo 385 architecture, with a CPU clock speed of up to 2.8GHz, an Adreno 630 HPU, a dual-channel LPDDR4X memory support, a peak download rate of up to 1.2Gbps, and the peak upload rate of 150Mbps. According to the official information, compared to the Snapdragon 835, the Kryo 385 CPU performance increased by 25%, the Adreno 630 GPU performance increased by 30%, power consumption reduced by 30%, and it comes with an integrated Spectra 280 ISP, supporting 4K HDR 60fps video capture. It runs on Nubia UI 6.0 with an ET evolution tensor technology. The Nubia X scores more than 290,000 in AnTuTu, which is quite close to the highest score that the current Snapdragon 845 processor can run. As for this benchmark, it’s a standard for the SND845. The phone scores as high as 8502 points, which brings it to the top 4. The continuous reading speed is around 730MB/s, which is a standard UFS2.1 performance. As for the cameras, the Nubia X comes with a 16MP + 24MP dual-camera on the front. The sensors have an aperture of f/1.8 and f/1.7. The 1.26”CMOS of Sony IMX519 has a unit size of 1.22 microns. The soft light next to the camera sensors is considered to the world’s largest one. Therefore, it’s assumed the Nubia X will provide the best selfie experience. This camera is also equipped with AI selfie filter, which is capable of identifying the person’s gender and adjust corresponding beauty options. Say, for men, it uses the new French Black and White filter to provide magazine-level selfies. Of course, this camera supports AI smart scene recognition. In macro shots, we can notice the Nubia X got quite a good optical blur effect, the focus is fast and accurate, the picture body is rich in details, the petal lines and tiny stamens of pink flowers are vivid. For the backlighting photos, under the strong contrast in the daytime, the Nubia X’s performance is also quite good. Though there is some noise at the bottom of the eaves and pavilions, the sky is clear. The Nubia X’s white balance performance is normal. Though there is some noise in the photos, the light source is slightly exposed. As you can see, after using the beauty, the skin of the face is more delicate and smooth, and the color of the bags under the eyes disappears. It can be also seen that the front portrait effect of the Nubia X is much better than that of the front single camera. The portrait is accurate, there is no blurring error, and the background is also empty. The Nubia X is packed with a built-in 3800mAh battery. We tested the battery, by setting the volume at 20%, the brightness at 50%, and playing a 60-minute online video, when the remaining power was 87%. After the test, the power dropped to 75%. Thus, in an hour, the phone consumes 12%. So a simple calculation shows the Nubia X can play online videos for about 8 hours. We also used the PUBG game to test the phone’s endurance when playing heavy games. After 30 minutes, the 99% remaining power dropped to 87%. Thus, our protagonist can play games for 4 hours. The Nubia X comes with a 9V/2A fast-charge head. Starting from 5%, without a card, and being connected to Wi-Fi, it took only 110 minutes to fully charge the phone. In general, at the price of 3,299 yuan, the Nubia X is the most technologically-savvy and most recognizable full-screen flagship that you can buy. Of course, it’s innovative, it comes with top-end hardware and quite intelligent software. In many aspects, it’s the first in the world. 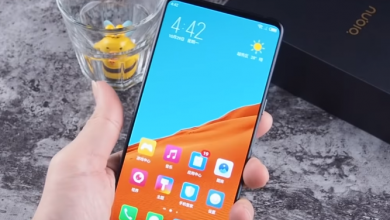 But as we are dealing with the first dual-color-screen smartphone on the globe, it requires some time to understand whether it will go viral or not. Hi. Thanks for the review. I’m interested in knowing what countries the phone will work in…other than China. Any ideas? Surely, there will be the international variant. Maybe the only exception will be the US. hai there … all the display are in chinese or english and does it have play store ..compared to Huawei which one would you recommend. Hey, of course, it supports English as well.